Chris Chester. PIC: Allan McKenzie/SWpix.com. Trinity host last year’s Grand Final winners in their 10th league game of the season, hoping to make it three home wins in a row for the first time this year. Chester will come up against former Wigan teammate Adrian Lam, with the pair having played together at the Warriors in 2001. Wakefield could move six points ahead of tonight’s opponents with a victory, further cementing their place in the top five, following last week’s 17-16 victory over Huddersfield Giants. “I was only young when I played with Lammy [Adrian Lam], and I learnt a hell of a lot from him,” said Chester. “I speak to him quite regularly and he is a good friend, but friendship goes out the window tonight. Chester has confirmed that Anthony England will return to Wakefield's 17-man squad tonight. PIC: James Hardisty. “Wigan have got a couple of decent wins and I thought they were good against Castleford last week. 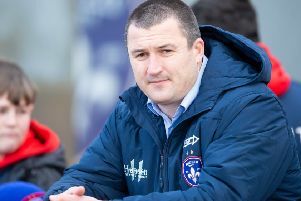 Wakefield have won five of their opening nine games but Chester feels his side are yet to deliver an 80-minute performance in 2019. Chester admitted: “I still don’t think we have put in an 80-minute performance. “I thought we were excellent in the second half against Huddersfield, we were really dominant. “It is probably only at Hull where we really clicked but that came at a massive cost. “We lost Tom [Johnstone] and Bill [Tupou], and that has really hurt us. “But I am hopeful of a really good performance tonight. 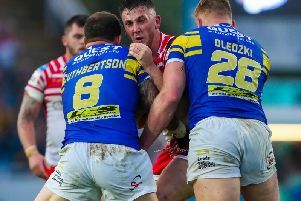 Anthony England will return to the match-day 17 after missing the victory over Huddersfield with a neck problem.